This post, and other related posts that will probably be forthcoming by Laura Lam, Jennifer Williams, and by Lou Morgan was inspired by a tweet Laura made about finally getting herself a shiny new desk. I’m always curious to see other people’s creative workspace and what they surround themselves with to help them write or focus, or maybe it’s stuff they have to hand. I wonder if they have posters or inspirational quotes on the wall, what books they have on hand for reference, or toys, or a whole bunch of other things I’m sure I can’t imagine. Below is a picture of my desk and below that a quick guide to some of the junk on my desk and why it’s there, plus what is just out of sight. Quick mention about the desk itself, it’s massive and it’s totally plain, but it’s one I’ve always wanted, so I have everything I want right there, to hand, and it’s perfect for someone like me with long legs. 1 – My pop shield, for recording podcasts. Headphones for the same and also for listening to music and podcasts, which are vital for long daily commutes for the day job. 2- Post it Notes. I’ve now started using digital ones on my phone when I’m out and about, for ideas, or to remember things I need to buy, but sometimes physical ones come in handy. 3 – Current Work in Progress. I’m doing yet another edit, going through it, line by line, with the red pen. 4 – Glass bowl. Currently empty, but normally it has chocolate it in to keep me going. Vital for any creative person. Well, that’s my excuse and I’m sticking to it. 5 – Soundtracks plus other CDs. I’ve transferred most onto my PC, but sometimes I add new CDs, or buy new stuff and it stacks up there. I usually write with music to help get me into the right headspace. Not to set the mood, but just to help me focus. 6 – iPad. I’ve only had one of these for about a year, and it was a gift, otherwise I wouldn’t have bought one. I’m actually surprised to say I use it quite a lot for bits and pieces, reading digital comics, watching the news from the BBC with breakfast, social media stuff and so on. 7 – Just under the iPad is my current, must read comics. There are about 3 trades under there. Just to the right, off screen, is a stack of another ten trades that I then gradually move up to my desk when those are gone. To the far right, is a set of shelves full of comic trade paperbacks and hardback comics. 8 – On top of the printer, the big golden book. A recent birthday present, the Golden Age of DC Comics – 1939 to 1956, which details the history of DC comics during that period and it covers several of their characters during that time including, Superman, Batman, Wonder Woman, Green Lantern (Alan Scott, not Hal Jordan or any of the other modern Lanterns), The Flash (again the original one – Jay Garrick), Robin, Plastic Man and Hawkman. A cracking good read to dip in and out of for a lifelong DC comics fan like me. 9 – My trusty laser printer, when I just have to print stuff out and see a physical copy so all of the things that need fixing are suddenly so easy to see. 10 – Beside the printer. A couple of reference books – Eats, Shoots and Leaves, a guide to punctuation. Also a copy of Collins Thesaurus when I need something different, but not totally obscure. I don’t actually have any inspirational words or poems on the wall, but I do have several comic book prints, two by a favourite comic book artist and writer, Terry Moore, two movie prints, from Rocky Balboa and The Green Mile (both favourite films of mine) and several other bits and pieces making it completely my space. The rest of the room is full of books to read and my to read pile is pretty hideous at the moment. I’ve actually banned myself from buying any new books for a while, but we’ll see how long that lasts. 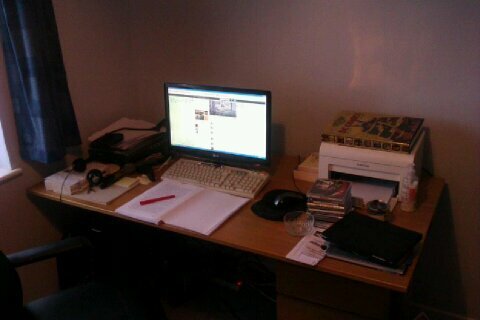 So, that’s my work space, what do you have in yours and why? If you post one of these, please link it back to the others so we can keep the chain going.